The print head is obstructed by paper or another foreign material. Turn off the printer, remove any obstructions, and turn it back on. If the error persists, contact Epson. Except in my case there was no obstruction. I noticed that the printer was making a loud “whurr” or grinding sound right before it would get the error that just didn’t sound right. On the left side inside the printer there is a gear towards the bottom and I could see it move when it made that that sound so apparently the error occurred as the printer tried to test the paper feed mechanism. Upon closer inspection I noticed that there is a plastic piece that locates the feed rod and it had popped out. What this did is allow the gear to move around as the printer tried to turn it, causing the gear to slip. The printer was recognizing that it could not feed paper and stopping with the above error. So, nothing to do with the print head and everything to do with the feed mechanism. WARNING: Do any of the following at your own risk. There are delicate mechanisms inside the printer that could easily be damaged and as this is an electric powered device there could be safety issues. The safest thing to do is get a professional to do the work, otherwise it is up to you to take proper safety precautions and protect your equipment. None of the following information and pictures depict any necessary safety measures or techniques. The fix was simple. What I did it take some angled pliers and tap that piece back into the metal bracket. Sorry I don’t have any “before” pictures with the plastic piece loose but the problem is that it gets pushed out to the right and was not firmly seated. 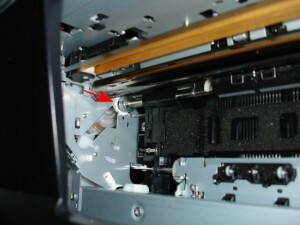 The following shows a red arrow pointing to the plastic piece on the left side of the printer. This is after I seated it back into place. Before positioning my pliers I first turned the plastic piece with my fingers so that the “wings” on the side were positioned so that I could put the end of the pliers against them. I then took the pliers and carefully placed them all the way back in there to the side against the metal bracket. I then took a long screwdriver and lightly tapped against the side of the pliers, causing them to push the plastic piece into place. Regular pliers would probably work as well, you just have to be careful. 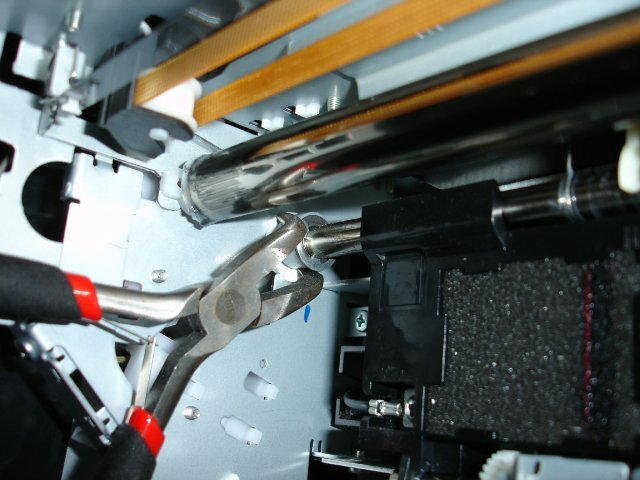 WARNING: Be extraordinarily careful with bare metal tools inside the printer like this. You do not want to scratch the print head rod just above. It might be a good idea to wrap the end of your tools in electrical tape or something before attempting this. Don’t clean any of the oil/grease off either, the printer needs that lubrication. A few taps against the side of the pliers seated that plastic piece back in place. The printer works now! It might be hard to see in the previous picture but the gear behind the metal bracket has lost the ends of its teeth due to being stripped off. Definitely not a desirable condition for an expensive printer like this but the printer works for now. I wonder if it’s possible to buy a replacement gear. I will have to keep an eye on that piece to make sure it doesn’t pop out again. I have compiled a static version of cryptsetup for Android that can be used to create encrypted partitions/filesystems. I actually compiled it on my phone as that was easier than cross-compiling due to cryptsetup’s numerous dependencies. It seems to work fine on my rooted HTC G2 running CyanogenMod 7.0.0. Even though it’s a static binary it still has a few runtime libc dependencies so your mileage may vary. You must have root and be comfortable using a command prompt to use this. You’re messing with the filesystem here so be careful and use at your own risk (keep backups). Performance is adequate, I get about 8 MB/s when running the CPU at 1 Ghz and using my slow class 4 SD card (the card is slightly faster than what the CPU can do at that clock). I’m not sure how much that could be improved with this hardware but it could certainly use a boost. Check /proc/crypto to see which algorithms your kernel supports. I tested aes-plain with the stock Cyanogen kernel. I put cryptsetup in /system/xbin so it’s in the default path. There may be shortcuts for some of that if you’re using a more functional version of mount that understands LUKS volumes. Then in Qt Creator look under Tools->Options->Text Editor->Font & Colors and select the Color Scheme “VisualStudio”. I will probably make adjustments to this over time as this is just my first cut. Send me any improvements.